Whether you’re building a new home or considering new cabinets as part of a home remodel project, one of the first decisions you’ll face when it comes to your cabinets is whether to choose custom cabinets or pre-manufactured (box) cabinets. Each home is unique, and one of the greatest benefits of choosing custom cabinets is the flexibility to design something that will work within your specific space. Box cabinets are produced in a factory and come in standard sizes in set increments (typically 3”). More often than not, the space you need to fill will not be within those exact increments. The solution is to order cabinets that are smaller than the total area, using fillers to make up the difference. While fillers can be made to look like they are part of the overall cabinet design, they will not be utilizing the space to its fullest capacity. 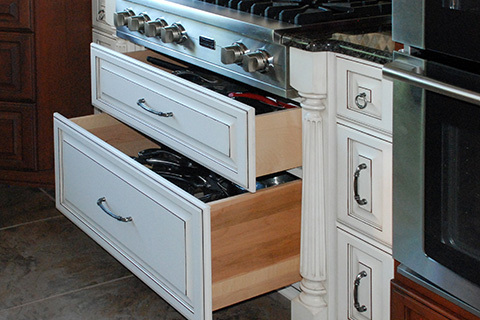 Custom cabinets can be built to any size, maximizing storage potential. Cabinet makers can help you figure out how to take advantage of spaces around appliances, windows, plumbing fixtures, and other existing elements. Even in odd-shaped areas where it may be impossible to find a box cabinet that would work, custom cabinets can be built to fit exactly. Just as custom cabinets can be designed to maximize storage, they can incorporate functional, built-in features that help keep you organized and decrease clutter. Box cabinets without these built-ins may leave you constantly rummaging through drawers and cabinets to find what you need. With so many choices between door styles, profiles, hardware, finishes, and wood species—and the ability to mix and match them—custom cabinetry provides endless possibilities for creating a unique look. Custom cabinetry is also a good option if you are looking to match the style or finish of existing cabinets or woodwork, especially if you want to enhance the original, timeless charm of an older home. With box cabinets, many styles eventually become discontinued, making it difficult to find a match for older cabinets. Working with a custom cabinet maker means that your cabinets will be carefully crafted by hand in a cabinet shop—not mass produced in a factory and then stored in a warehouse like box cabinets. In a cabinet shop, custom cabinets are built with attention to detail, and your cabinets will be manufactured as a group, ensuring the finishes match meticulously. Once completed, they are ready to be installed in your home! Wondering if our experts can design the perfect custom cabinetry for your space? Just give us a call!